Compassionate care for your pets! Handsboro Animal Hospital in Gulfport, Mississippi was established in the mid 1950’s by Dr. E.W. Cole under the name Cole Animal Hospital. In 1972 Dr. R.C. 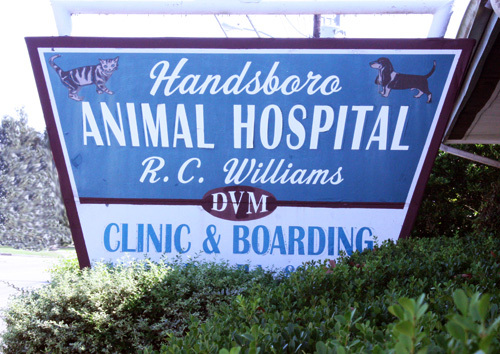 Williams purchased and renamed the clinic Handsboro Animal Hospital. Since then Dr. Williams and his team have strived to bring your pets the utmost quality of care. The doctors and staff of Handsboro Animal Hospital know that your pet is an important part of your family and are committed to providing excellent care to make sure you and your pets’ needs are fulfilled. We strive to promote responsible pet ownership, up-to-date preventative health care, and compassionate care for sick pets. Handsboro Animal Hospital has been keeping the pets of the Gulf Coast Community safe and healthy for over 40 years and is dedicated to continuing that care for you and your family. We are a full service veterinary facility committed to providing you and your pets with convenient, personal care at the highest standards of veterinary medicine.